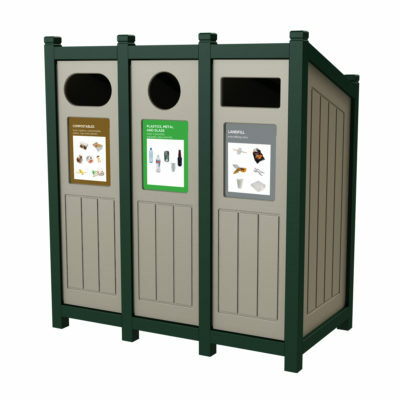 You don’t ever want to compromise function for style – which is why CleanRiver has designed its outdoor recycling bins collection to be durable, versatile and attractive. 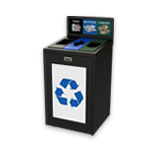 Designed with a deep understanding of climate, behavior and even wildlife considerations, the CleanRiver outdoor recycling containers ensures seamless recycling from the outside in. 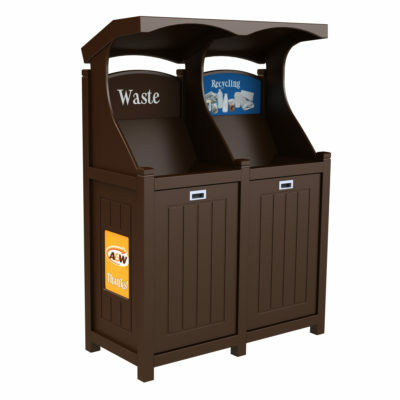 The sturdy Excel Dome Top recycling station is designed with a curved roof which sheds rain and snow while adding an attractive design element to the bin. 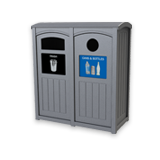 Available in multiple capacities and numbers of streams with your choice of colors and openings, the Dome Top can be tailored to suit your recycling program. 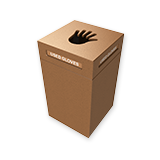 This rugged all-purpose, high performance container is flexible enough to be used indoors or outdoors. The front openings and slanted roof keep the elements out of the bin, and high visibility eye-level graphics keep your streams clean. 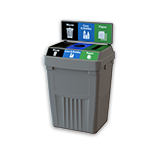 The TXZ is a Transition® container so you can easily add, remove or right size the streams to suit your needs. 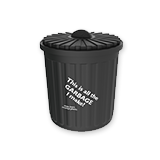 This sturdy container is designed for use in high traffic areas. It features front deposit openings and front service doors with rigid liners for easy servicing. The slanted roof design avoids buildup of dirt and debris and self-cleans with rainfall. This sturdy container is built to withstand heavy use in high traffic areas both indoors and outdoors. It features flat top styling combined with front service doors, and front and back deposit openings for access on both sides. 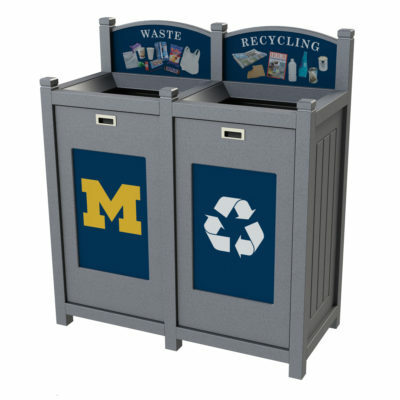 Keep your streams clean on game day with this sturdy container designed for high traffic areas such as stadiums and special-event venues. 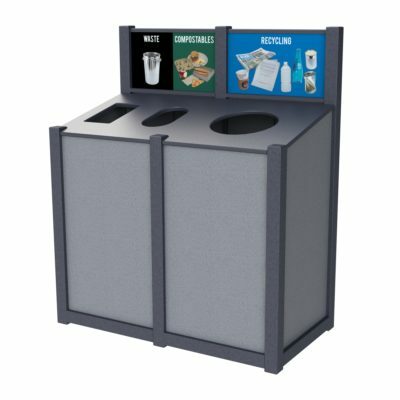 The high visibility central graphic and large openings help people toss their waste into the right stream as they walk by. The unit is accessible from both sides which is very effective in crowd situations. This high capacity unit has front or rear doors for quick and easy servicing. This sturdy container is built to withstand heavy use in high traffic areas both indoors and outdoors. It features flat top styling combined with front or optional rear service doors, and top deposit openings. 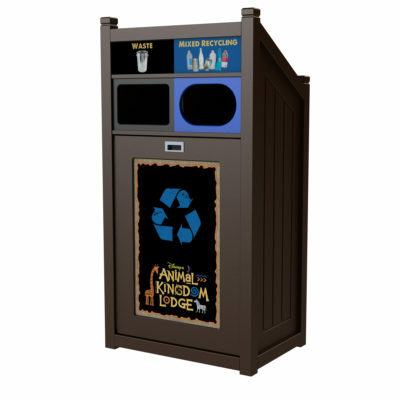 The integrated backboard includes high visibility graphics to help people make the right choice when they discard their waste. This sturdy container is built to withstand heavy use in high traffic areas both indoors and outdoors. It features flat top styling combined with front or optional rear service doors, and top deposit openings. Available in multiple capacities and streams. 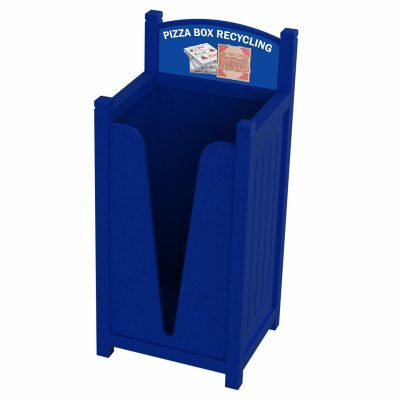 Keep pizza boxes from filling up your trash with this easy to use pizza box recycling bin. 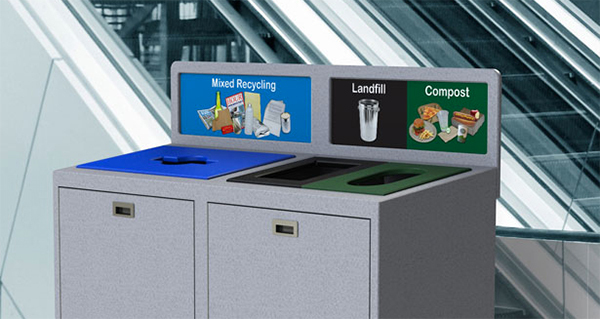 The Excel Pizza Bin is designed so that the pizza boxes stack on top of one another to avoid bottlenecks in your recycling stream. Use alongside your existing CleanRiver products or on its own. 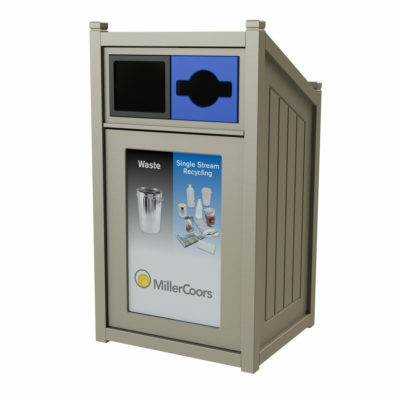 Designed to be simple yet durable, this economical unit includes a high visibility graphic backboard, a hinged lid and unique bag clips to hold bags firmly in place for easier servicing. Suited to indoor or outdoor applications and is available with either one or two streams per compartment. Available with multiple opening and color options. 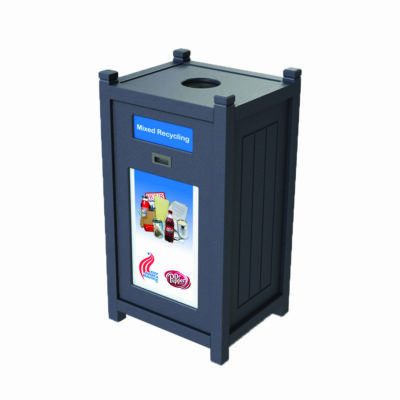 This sturdy unit is designed to collect large volumes of waste in high traffic areas. 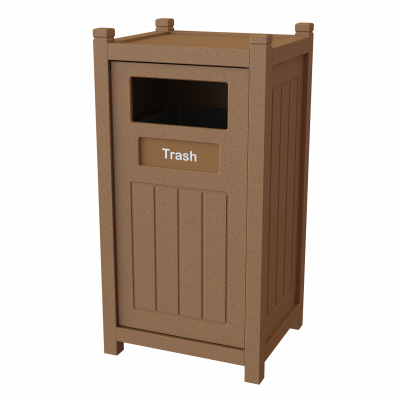 The angled backboard is designed for high traffic; high speed areas where waste may be tossed over a distance such as drive-thru situations. The straight backboard is designed for high traffic areas such as entrances to events. The TXS offers rugged post and strut durability in high traffic areas. The Transition® features allow you to right-size the number and volume of streams. 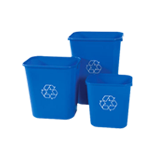 The container can collect up to two streams per compartment. 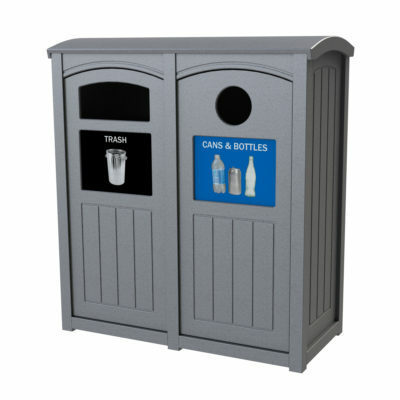 The slanted roof and front openings keep the elements out of the bin. Includes a large high impact front graphic which provides the opportunity for branding and education.